Hermione de Paula has been referred to as the “White Witch of wedding dresses”. Her dresses embody a world in which the exotic and the magical meets the traditional English rose country garden to create something entirely unique, enchanting and elegant, a hallmark that has underpinned her artful aesthetic from the beginning. Hermione de Paula promises a world of exquisite dresses, lingerie and swimwear, all made by heart and by hand with the highest quality fabrics. This is luxury bridal couture done to perfection. With respect to the environment and an oath to quality, HdP offers one-off pieces to cherish forever. LL: How did Hermione de Paula come into being, what’s the story behind it? Hermione: I graduated from Central Saint Martins with a 1st class degree in Fashion and Print, launching the label in 2008 after time gaining experience at Christian Dior Couture, Alexander McQueen, John Galliano and Giles. Since then, our vivid prints, illustrations and embroideries have leapt from simply the realms of ready-to-wear into multiple lifestyle categories with a renewed focus on couture bridal. Hermione de Paula Bridal debuted in summer 2013 after the first launch of our embroidered evening wear gowns from the previous season sparked a dear friend to ask if we would consider making her wedding gown. I loved the sentimentality of creating heirloom works of wearable art and the overwhelming creative reward that brings. After a whirlwind year of word-of-mouth bespoke bridal creations and recommendations, which saw the launch of our bridal designs full time in 2015 with a now ever-growing botanical library of creations, offering multiple tiers of service. LL: What makes and keeps HdP unique? 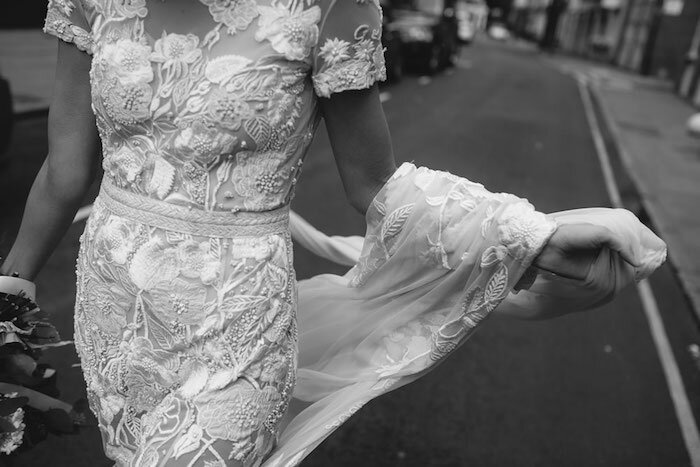 Hermione: With a modern approach and an eye with an edge when it comes to the world of the wedding dress, a Hermione de Paula bridal gown is like no other. Romantic surrealism combined with traditional florals with a look-closer approach, elaborate hand-drawn artworks and embroideries are always at the heart of our work. Lovingly designed with the bride, each piece is an entirely individual and personal work of art. The dress is designed for you: it tells your story and you will be the only one in the world to wear your unique creation, with no two dresses ever the same. Specific details and design notes such as secret messages, names and dates created just for you make your gown magically unique and full of romantic sentiment to tell the story of your love and relationship on your wedding day. A Hermione de Paula gown will be a wonderful talking piece on the day as you reveal the secrets woven in to your guests and family over a glass of champagne. Our favourite messages are ones that make people laugh and smile, bringing even more joy to the celebration of their life. LL: From where, who or when do you seek inspiration? Hermione: A memory, a dream, an adventure or tale. For my collections I take notes in the form of florals and foliage, keeping a pressed flower dairy from all my travels and experiences. Even in-between my passport pages you’ll find flowers pressed between the old ticket stubs from previous boarding passes! For my bespoke creations inspiration always comes from the bride herself, a muse if you will, studying her strength and femininity and capturing her beauty within and out. The unique love story between her and her partner, or a sentimental landscape they treasure between them. The flowers her mother once grew in the garden she played in as a child, the florals that represent a scent to a cherished place, time or fantasy. Each story told becomes the seed of inspiration. LL: What qualities does the quintessential HdP bride possess? Our brides are fellow lovers of the creative arts. We all share a love for looking into something to find the true meaning and unraveling something to understand it's concept or what makes it tick. A philosophical not scientific approach to defining something which doesn't necessarily exist. It exists further then the physicality - it's about creating an emotional connection and a lasting memory. Our dresses go beyond material beauty. All of our brides have a wonderful sense of humour; they are free spirited, adventurous and fun loving. LL: What has been the most valuable lesson you’ve learned in creating and preserving your brand? Hermione: To be yourself and not worry about what other designers are doing or making. We don’t look and quite frankly we do not have time to. We have experienced many copy cats who have tried to steal our designs and aesthetic. They unashamedly write on our Instagram about how they will copy our work - they have even tried to copy our campaign look book. However, each of our dresses is unique and the brand comes from our personal intimate relationships, care and sensitivity with our clients – we hide so much love into the embroidery with secret messages and personal touches that only my team and the bride and who she wishes to share with would ever know about – you can’t copy a shared sense of spirit, and the heart and soul and energy that goes into each dress. We believe you have to nourish to flourish and that's how we approach building the brand. We are proud of our client relationships and the the unique bonds we create. I’ve met so many kindred spirits and become wonderful friends with many of our girls and some with be friends for life. We made not only a work of art together in the form of a dress but also a friendship was born. I’ve been on holidays with my old brides and often meet up for coffees with others, yoga and craft evenings such as floristry workshops and ceramic making. It's lovely! LL: What would be your advice for someone seeking the perfect dress, outfit or items for their special day? Its not just about how you look on your special day but it is just as importantly about how you feel and the memories you will treasure forever from wearing it. Our creations are designed to captivate and represent the best version of the bride, her true self, enhancing her beauty and confidence. Traditionally brides can often be forced into wearing something that feels very stiff and rigid and they don’t feel comfortable in, not only physically but also emotionally as its not what they would choose to wear, perhaps the style of dress has been imposed by family or her in-laws for example. We will always try to find the balance between keeping ‘Mum happy’ and also illuminating our bride's personal style and representing her character on her big day. Exquisite lightweight embroideries and soft fine fabrics make our gowns comfortable to wear, drink, eat, and dance the night away in. They have been created to have fun in. Whether it took 8 months, 18 months, 2 years or longer to design and make, we’d love nothing more than to hear that the gown ended up sprinkled in a little champagne and has a dusting of summer grass stains from frolicking with the wildflowers and dancing in the fields with her loved ones until dawn. After all, we are perfectionists and every last bead is agonised over until the moment she walks down the aisle to meet her man…and then all we care about is she lets go, relaxes, and has the time of her life wearing it.